Krista is the founder and owner of FitBody By Krista and FitBody Online. She is also a distributor for Advocare, a health and wellness company. Krista’s love and passion for movement and fitness began at the young age of 3, when she began dancing. She continued this passion for 18 years before successfully transitioning to the fitness industry. Krista has a degree in Exercise Science & Wellness and is an ISSA and NSCA Certified Personal Trainer with over a decade of experience. Krista is an Integrative Nutrition Health Coach and has several group fitness certifications including Kickboxing, Boxing, Spin, Kettle Bell, TRX, Total Body Conditioning, Functional Training, Core Strength, Junior Fit Program, Barre, and Strength & Conditioning. In September 2017, Krista opened a personally-customized gym and fitness studio. Besides offering a variety of classes including Bootcamp, Barre, HIIT, and Metabolic Conditioning, Krista has launched her online training business, which is a unique experience that she can offer to people living near and far. FitBody By Krista Online became an instant success! Her online training programs are a unique way to experience a truly rewarding transformation and to celebrate success with a professional photoshoot with some of the top fitness photographers and makeup artists. The ultimate goal of the 12-week Photoshoot program is to transform the body and help each woman gain confidence physically and emotionally. 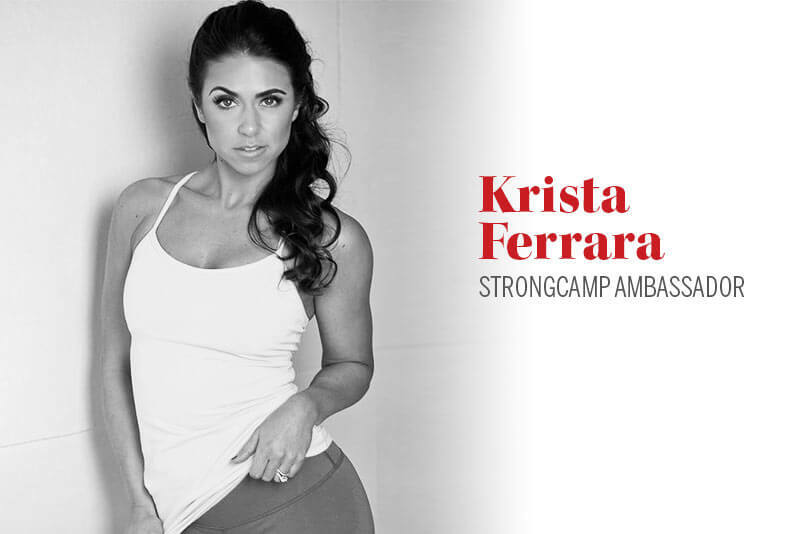 Krista has coached dramatic mind and body transformations throughout her career. With her personal training skills, education, and geniality, Krista’s mission is to safely educate, challenge, and motivate her clients, hold them accountable, and help them achieve their mind, body, and health goals with personalized fitness programs and nutritional counselling. Whether new to fitness or an elite athlete, her training programs are designed to meet each client’s individual needs and goals, and to challenge and shock the body into results! Krista is a mentor, coach, and friend to all of her clients and she looks forward to changing the lives of those she has yet to encounter. STRONGCAMP is an amazing opportunity to meet and transform with this dynamo!